Sitting back, relaxing on couch after dinner, red wine in hand. In shorts, this is the desert, legs crossed. Killed 'im, but spilled the wine on myself and ruined a pair of shorts. Must learn greater composure. I know by experience that their lethality is greatly overrated. UPDATE: chuckle, yes, I should have worded that more precisely. 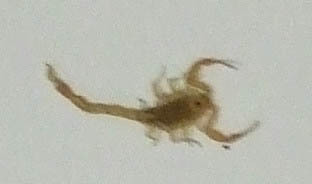 I wouldn't get THAT upset at seeing a "deadly" bark scorpion on my leg. I've been stung 3x by them, never bothered to go to an ER. A doc friend told me all the data on lethality involves infants in rural South America, where medical help is far away. For me -- I'd take their sting over that of a bee. You feel a stab like a needle, smarts some, and then an electrical tingling goes up your leg, lasts for anywhere from eight to 36 hours. In a bad case, walking is a little difficult because leg won't coordinate perfectly. I'm told the bigger ones aren't like this, and the venom hurts pretty badly. The smaller the scorpion, the deadlier the sting. Did you know they glow under blacklight (UV light). You can pick up a blacklight flashlight for like $15 on the internet. This way, you can light them up before they get to you. I don't know ... that looks like a nasty little straw colored scorpion. When growing up in your neck of the woods (err, desert) I was warned those are worse than the little black ones that we normally found. I think your use of lethal force was fully justified. Your shorts need not be ruined. There are several good red wine stain removers on the market. I've also heard that white wine will remove a red wine stain. BTW, I'm glad we don't have those nasty buggers up in the NE. Their lethality is overrated, yes. But the family members who've been stung by ones that look just like that describe it as initially feeling like a bee sting. And then shortly feeling like the area of the sting is getting hit with a sledge hammer with every heartbeat. On the plus side, soak the sting area in water with Epsom Salts in it, and it calms it right down. In other trivia, smash one on concrete and leave it there - the next morning you'll see an etching of the scorpion in the concrete . . . .
...Mr. Hardy ruined his shorts and spilled his wine, Steve, but he didn't say it was the wine that ruined his shorts. ..Perhaps he was being circumspect for reasons of civility and decorum. And maybe it was the wine. When I was a little kid in Las Vegas, I remember a neighbor of ours getting stung on the arm; the whole limb swelled up so badly that the skin was tight and shiny, and he had to go to the hospital. Not sure if it was an allergic reaction or the type of scorpion. People often speak of a .410 pistol as being a very good snake gun. I would think that the Swiss mini-gun in 2.34mm would be a good scorpion gun. Probably need one of each in the desert. "You feel a stab like a needle, smarts some, and then an electrical tingling goes up your leg, lasts for anywhere from eight to 36 hours. " Perhaps that is what really happened to Chris Matthews. Get yourself an accurate airsoft pistol that shoots 300+ fps. The bbs will kill penetrate the scorpion, but if you manage to shoot yourself with the bb at point blank range, it'll hurt like hell and a blood blister will form, but it won't be as bad as getting stung by one of these nasty buggers. growing up we learned early to shake out all your clothes and shoes/boots before putting them on because these mean little bastards were everywhere. And they hurt. Wow, killed two of those today. Stepped on one that I didn't see until too late, I was wearing shoes, and smashed the other one that the dog was playing with in the dining room.